The irony is that nobody is more guilty of quote mining the bible/koran/torah than those who preach from it, conveniently picking, as they do, only the paragraphs which support what they wish to preach and totally ignoring the rest. Great strip, author! Kudos to you. There is missing a “be” in the third panel. Thanks for the typo-alerts. Fixed it now, but it may take an hour or so for the change to filter through the various caches I’ve set up. 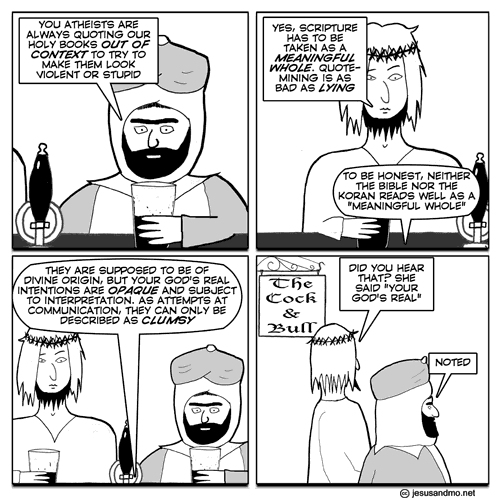 Panel three is a clear case of “to be or not to be”. Brilliant, one of the funniest for a while, particularly as it is generally the theists, not the atheists, who delight in quotemining, as we see here. With the bible, there is no need to take quotes out of context to make them sound stupid or vile. 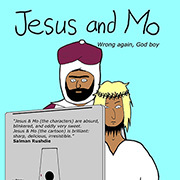 Just noticed, are Jesus & Mo on summertime? Have a cool Yule, everybody! This trick panders to infantile nerds. Jon is right. Both sides quote mine. It’s just that the believers quote mine for the stuff that makes their side look good. It’s like pointing out Al Capone gave money to charity while ignoring his criminal activities. Finding wisdom in the Bible (or Qu’ran) is a bit like sifting through a chemical toilet and proclaiming “Oh, Look! Corn!”. Is it really worth eating? The comments are nearly as good as the cartoon. I get much pleasure from both. Keep up the good work. 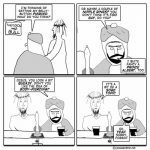 Why do we never see the barmaid? She has so much bottle that I’m becoming convinced she’s a spirit, though at the moment I’ve only got 40% proof. Happy Birthday for sunday, Jesus. I hope Mo’s bought you something special. Note to pedants: Yes, I know that he wasn’t really born on Christmas day, yadda, yadda,yadda. Peace, love, and a large dose of rationality to you all. When dealing with Bible thumpers, I’ve successfully pointed out that, if one is willing to cut and paste enough, one can make a phone book say anything one wants. Usually shuts ’em up pretty good. Merry Saturnalia & a Happy Winter Solstice to all! @Justin Zimmer – Lovely image! I’m going to use that one. The Bible isn’t the Word Of God(TM), it isn’t even entertaining fiction. Is actually rather dull and (ironically) uninspired. For my money, when I want good mythology, I read The Iliad and The Odyssey. They are at least entertaining. Poor Jesus, he don’t even know what day is your real birthday. What kind of bad parents change a birthday to match in another festivity? Because the barmaid is actually the cartoonist. Surely she could use a body double, just like Mo does. Maybe a job for Katie Price or Paris Hilton. Now there’d be a fatwah we could all take pleasure in! Barmaid (peace be upon her) missed a chance here. Why didn’t she just play the boys at their own out-of-context game and simply agree that scripture is indeed a ‘meaningful HOLE’ – a black one; it’s where the truth vanishes, never to be seen again. Got to now, so as they say round these parts; “Merry Syphillis and a happy Gonorrhea to you all”. Hurrah. It grates when people claim these holy books are good moral guidance. No one could possibly derive valid meaning from them if they didn’t already know it. They’re a word search puzzle of morality. A jumbled mess of nonsense out of which you can pick advice if you know what you’re looking for. Rationality has many faces. Every so often I think I catch a glimpse of the Barmaid in my mirror. I look and suddenly FLASH! I think I see her and then she’s gone! Just like that. But most of the time I see my own face. Not so exciting, that. Well, to my Mom. Prospero New Year. A woman walks in to a pub and asks the barman for a double entendre… So he gives her one..
Keep the barmaid invisble, artist. No picture could do her justice. One could also make the case for: “Divine origin… can only be described as clumsy”. John, glirble splorch bi nurgle nurgly blarkle. You may think what I just said doesn’t make sense, but it would if you read the other 32,767 pages. Would PZ’s “The Courtier’s Reply” be useful to the discussion? Taking what they want to hear. Also, what’s with the barmaid’s new speech bubbles?